An Egyptian-Australian mission from Maquarie University has accidently uncovered the burial chambers of Rimushenty and Baqet II, who were top officials during ancient Egypt's Middle Kingdom and rulers of the country's 16th Nome. 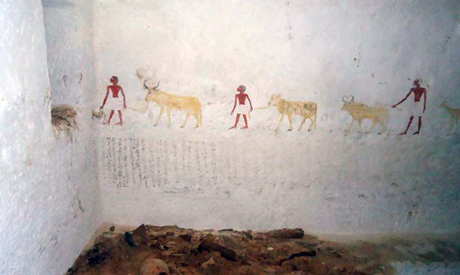 The discovery was made while the team was carrying out cleaning work inside a tomb at the Beni Hassan necropolis in Minya governorate. No mummies or sarcophagi were found in the burial chambers. Ayman Ashmawi, head of the Ancient Egyptian Antiquities Department at the Ministry of Antiquities, said that Rimushenty's burial chamber was found at the bottom of a three-metre-deep shaft. Ashmawi told Ahram Online that no funerary collection was found inside the main burial chamber, explaining that the collection "was probably removed by British Egyptologist Percy E. Newberry, who worked in Beni Hassan necropolis between 1893 and 1900." Ashmawi said that the burial chamber has an empty rectangular space that likely once housed the now-missing sarcophagus. A collection of clay food containers was also found in two side burial chambers located to the east and west of the main chamber. 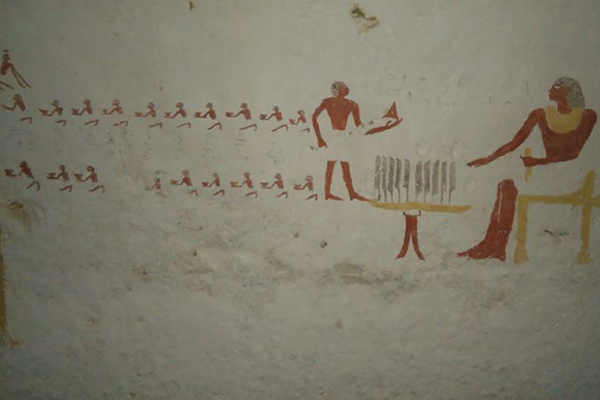 Gamal El-Semestawi, General Director of Middle Egypt Antiquities, said that Baqet II's burial chamber has the same design as Ramushenty chamber. El-Semestawi added that the walls of the main chamber are painted with well-preserved coloured scenes dedicated to Baqet II. A collection of clay vessels was also found in the chamber. Egyptologist Naguib Kanawati, the head of the mission, said that the team will resume its work in January to clean, restore and study the wall paintings as well as inspect the shaft and burial chambers as the first step towards scientific publication. The mission has been working in Beni Hassan necropolis since 2009.